Your business is always growing and just as you outgrow your clothes, your business can quickly outgrow your branding. But how can you tell if you’re in need of a rebrand? Kelly and I did a Facebook live to talk to you about just that! 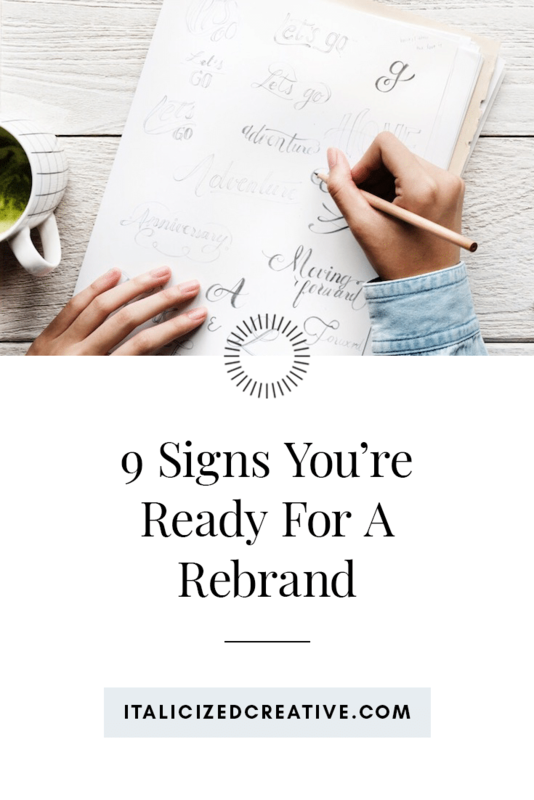 Watch the video below or keep reading for 9 signs you’re ready for a rebrand. A good brand should set you apart. When someone comes in contact with anything you put out into the world, they should automatically be able to tell that it was from your business. Think about some of your favorite Instagrammers. When you’re mindlessly scrolling your feed at midnight, can you identify the poster of an image from the image alone? If so, that business has done a great job at branding themselves. Their brand is consistent and stands out from the crowd. But on the other hand, how many times have you seen tons of images that look similar, but are from a variety of brands? These brands are blending in with each other, which is doing them a huge disservice. Your brand should be memorable. And if your current brand is similar to other brands, including your competition or a larger, well-known brand, then it’s time to seriously consider a rebrand. If you’re constantly finding yourself admiring other brands and wishing your brand was just as gorgeous, then a rebrand is overdue! Being envious of another brand is a sign that you’re unhappy with your current branding and deep down you probably know that it’s hurting your brand. You should be head-over-heels in love with your brand! After all, it’s the face of your business! Being envious likely means you’re not putting your brand out there due to embarrassment. And when you hide in the shadows, your business isn’t getting seen. And a business that doesn’t get seen doesn’t get customers/clients. In today’s world, there’s a 24/7 news cycle that changes at the drop of a hat. There’s always something negative going on somewhere. And with Facebook and the internet as a whole, word travels fast. And if that negative news story looks similar at all to your branding, then your business may be in hot water, regardless if there’s a connection or not. If that’s the cast, then now is definitely the time to rebrand! You don’t want your branding tied to a sinking ship! As our businesses grow, they evolve. Your vision when you first launched your business may be completely different than what it is now. Hanging onto your branding that fit your old vision isn’t doing your new vision any justice. Your brand is often one of the first touch points people have with your brand. If it doesn’t align with your vision, then they are being provided with the wrong message. That’s why it’s so important to make sure that your vision and branding are in sync with each other. We don’t want your branding mistakenly making the wrong impression! So when your vision changes, it’s time to reconsider your branding as well. If the thought of putting your brand out there makes you cringe, there’s a good possibility that you’re in desperate need of a rebrand. That shame you’re feeling when it comes to your brand is doing your business a disservice. As I touched on earlier, feeling embarrassed about your brand inhibits you from truly showing up. And in the world of business, your business needs to be seen in order to make a profit. Investing in a rebrand can help you feel better about putting your business out there and as a result, you’ll find that you’re selling more thanks to the confidence a beautiful brand can provide. Many business owners DIY their first brand. They fire up Photoshop and create something that they’re proud of… for a whole 2 seconds. Over time, their branding changes and doesn’t stay consistent. That’s because branding is so much more than choosing pretty colors and fonts. There’s a whole strategy behind it! A lack of clarity behind your brand can be detrimental to how your brand is perceived, especially when it means not showing up consistently. Diving deep into the whys behind your brand and getting laser focused can do wonders for your brand. Have your recently changed directions in your business? Maybe you’ve changed your offerings or sell completely different products. If so, then this is a major sign that you are in need of a rebrand. Similarly to when your vision changes, when your business pivots your branding needs to reflect those changes. After all, you don’t want your branding to misguide your potential clients/customers, right? Take a second and think about who you’re attracting. Are they your ideal clients/customers? Or are they completely different from who you had in mind? Attracting the wrong audience means that there’s a lack of clarity and alignment somewhere in your business, and it very well could be that your branding is wrong. For example, if you’re a wedding photographer who specializes in dreamy, romantic photos but your branding says otherwise, then you may just find yourself with leads that expect something different than what you actually offer. Now imagine if your branding was in line with those services. It would provide your ideal audience with a crystal clear picture of the type of business you are and who you want to work with. They’ll self select and you’ll be left with perfect clients who make your job worth it! After being in business for awhile, it’s natural to want to raise your prices. After all, you now have a bunch of experience backing you up and your services may be in high demand. But simply raising your prices often isn’t enough, especially if people don’t view you as a high-end service provider. Now there are a ton of things that can go into conveying value, but one of the most important things is your brand. If people associate your branding with cheapness, they’re not going to want to pay those higher prices. But on the other hand, if your branding elevates you and makes you look high-end, then you’re much more likely to be able to pull off those higher prices. Are you ready for a rebrand? If you agreed with one or more of those signs, odds are you can benefit from a rebrand. Get in touch with Kelly and I and we’ll hook you up with a beautiful brand and website that will make your business dreams come true! Our Bibbidi Bobbidi Bundle branding and web design package has everything you need to elevate your business and get noticed online. Click here to learn more and book your package.